1. Preheat an electric oven to 250C (482F) / gas oven to 230C (446F). 2. Beat an egg in a bowl. Mix in salt, grated lemon peel, and milk. Then sift in flour and mix with a whisk. *lumps are okay, you don't want to mix it too much. 3. Melt butter in a cast-iron skillet, or any pan that you can put in an oven. Stop the heat and pour in the batter. Then bake in the oven for about 8-10 minutes until puffed and golden brown around the edges. 4. Serve with a syrup of your choice and some fruits. 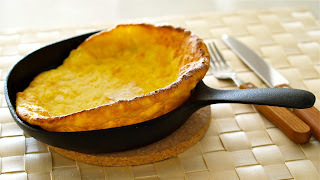 FYI: Basic toppings for dutch babies (I heard it later) are grated lemon peel, butter, lemon juice, and powdered sugar.